BAM blog: Harvey—House of Pain No More! BAM audiences cherish the Harvey Theater with the possible exception of the seats, which in their 80s bench-like iteration reportedly garnered the venue the nickname "Peter Brook's House of Pain." But good news: over the summer, renovations have been underway, including new seats. BAM Capital Projects Manager Carl Gillen reports on some of the changes you'll discover beginning later this month. 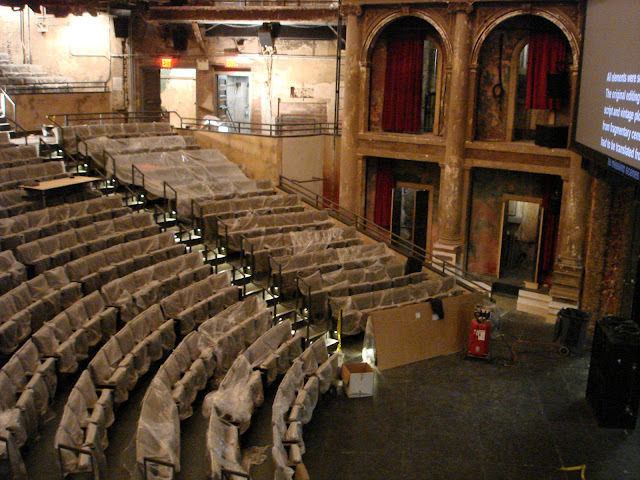 After being rediscovered for Peter Brook’s Mahabharata, BAM remodeled the Harvey Theater in 1986, creating an inner lobby and reducing much of the orchestra seating by raising the stage level almost five feet and joining the leading edge of the mezzanine level to a new semicircular thrust extending out toward the audience from the proscenium. The result was the intimate and familiar space we enjoy today. The 1986 retrofit recast the space, halting much of its deterioration and recreating the rest in the likeness of the Bouffes du Nord in Paris. Fast forward to 2011 when BAM began to rethink and redesign the space with Mitchell Giurgola Architects. In order to resolve the tricky curves and cramped conditions, we had to prioritize the challenges of the theater. The gallery level with its pedestal seats and vertiginous vantages was a tough nut to crack, particularly given the constraints of budget and schedule, so it was set aside for the time being (but stay tuned; this stage of the Harvey makeover is in development!). The orchestra seating, technical boxes, and stage became the focus. In June 2012, all of the orchestra seats, stage and seating platforms, and backstage technical box areas in the Harvey were demolished. Within this shell, we erected new light gauge framing and concrete platforms to support the upper orchestra, and new custom-built platforms for the lower orchestra and stage. The row depth and seat width were increased to alleviate cramped conditions, and armrests were added to the new padded seats for comfort. To fill and clear the house more quickly, we built side entrance aisles which allow patrons to enter directly from the lobby to the stage and lower orchestra. Once patrons leave the lobby and enter the house, their every step will be on a new-built surface. The cross aisle is wider, accommodating more persons with physical disabilities. To restore the space’s cinematic tradition dating from the 1930s, the retractable Steinberg Screen was installed below the stage and a new projection booth added at the back of the house. New walls and features were treated by skilled scenic artists to preserve the Harvey’s character. The Harvey, at its heart, is a time machine to the present, and your journey to the now should be more comfortable.